The 2018 Acura TLX is about to make its world debut at the New York Auto Show. 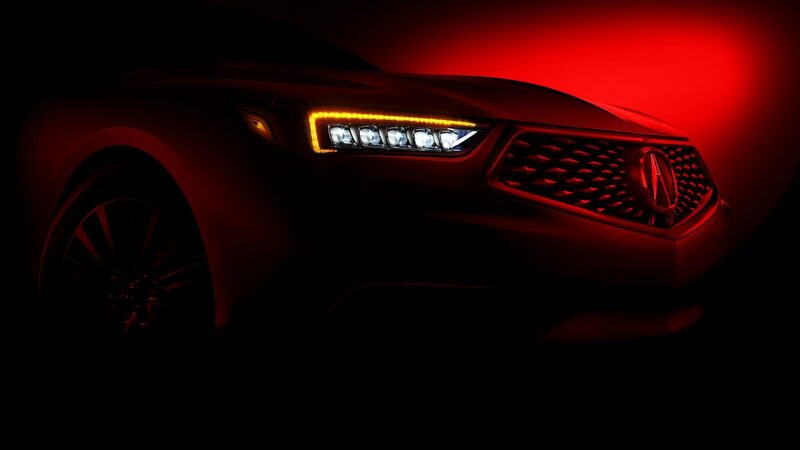 While its unveiling is only a week away, the teaser image Acura just released has got us impatient. Acura wowed the crowd at last January’s Detroit Auto Show with its Precision Concept car, a sleek, futuristic 4-door sedan that was billed as a physical embodiment of the future of Acura design. Later that year, the Precision Concept’s Diamond Pentagon Grille found its way onto the 2017 Acura MDX, and we can now confirm that the 2018 TLX will become the second member of Acura’s lineup to adopt the brand’s new signature front end. What could that mean? We have a theory. When the Precision Concept debuted in Detroit last year, its defining feature (the Diamond Pentagon Grille) ended up on a mid-cycle refresh later that year. At the Los Angeles Auto Show in November, Acura unveiled its Precision Cockpit, an automotive interior billed as a look into the future of Acura’s interior technology and infotainment systems. Unlike the Diamond Pentagon Grille, the technologies from the Precision Cockpit might take a little while to introduce into a vehicle; after all, drastically changing the way that a driver’s seat looks all at once might upset customers, even if it represents a leap forward for automotive design. With that said, we expect elements from the Precision Cockpit to join the Diamond Pentagon Grille in the 2018 TLX. Whatever the TLX’s big reveal brings, you can rest assured we’ll keep you in the loop!